Parallel power. A newly designed single-outlet parallel Port makes connecting two ezv p-series generators easy, combining the power of two units into a single output. Parallel cable Sold Separately. RV ready. The eZV3200P can easily power a large 13, 500 BTU air conditioner on its own. The Energizer eZV3200P is a fuel-efficient, portable inverter generator powered by an ultra-quiet engine and class-leading inverter technology. It includes premium features such as remote and electric start, a digital multi-function display, automatic throttle, automatic choke, integrated folding handle and wheel kit, threadless metal fuel cap, and covered outlets. 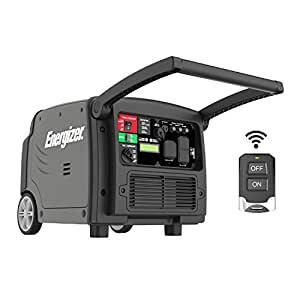 Producing a continuous 2,800 watts of clean electricity at 3600rpm, the eZV3200P quietly powers common and sensitive electronics during camping trips, tailgating, hunting, traveling, and jobs around the house or workplace. The integrated twist lock outputs 120V at 23.3A, perfect for powering RVs, trailers, and your home in an emergency. A newly designed single-outlet parallel port (with cross model support) makes connecting two eZV-series generators easy, allowing you to combine the power of two generators into a single output. At only 52-60 decibels the eZV3200P is so quiet you’ll have to hear it to believe it.